It’s more fun to tour The Bahamas on your tender. Caves, coves, and shallow waters are the perfect tender setting. But how do you stow your tender when playtime is over? Tenders come in many styles: small inflatables, fiberglass runabouts, rigid inflatables (RIB), center consoles, and extended limousines tending a superyacht. For most, they are a great part of the boating experience, especially when cruising The Bahamas. Anchored in a secluded cove, there’s no better way to explore the pristine waters than taking a ride on a RIB. Tenders can scoot over the shallows to that private island picnic spot or moonlit beach getaway. In more populated areas, local beach bars await, sometimes only accessible by a tender. It’s the perfect way to access dive and snorkel spots larger boats can’t reach. Which is why it’s so important to know the best way to stow your tender. Indeed, tenders are fun to play with and enable access to the shallows and shore, but storage, deployment, and retrieval can sometimes be a challenge. Even large yachts have limitations when it comes to tenders, and on small to midsize cruisers, it can be even trickier. The good news is there are numerous options that can work well depending on the size of the mothership and the type and size of tender. Some boats are designed to carry a tender. A properly designed boat garage stows the tender away in a convenient spot and allows for easy launch and retrieval. 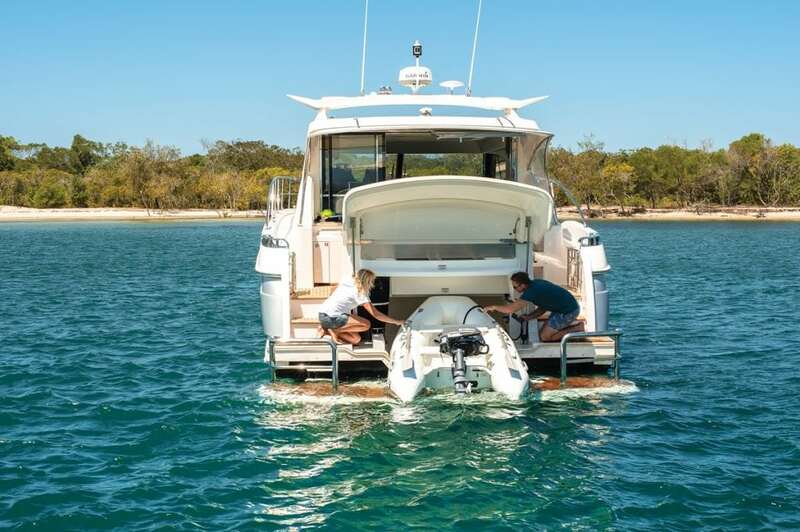 There are limitations to the size and type of tender that can be carried, but garages are a safe solution, and having the dinghy stowed keeps the boat tidy and out of the way for docking and dockside activities. Some vessels are designed to work only with a specific type of tender, such as a Williams Jet Tender, and some only accommodate relatively small tenders with or without outboards. The drawback is that garages take up storage space, and launch and retrieval can sometimes be difficult. While many popular manufacturers offer models with tender garages, you don’t see many on boats smaller than 50 feet. 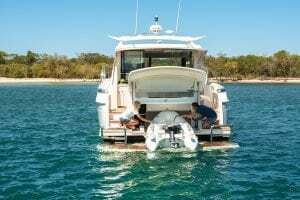 Garages are an option for people in the market for a new boat, but some boats simply don’t have them, and some boats are not big enough or the right style to use them. Crane davits are a popular option to launch and retrieve tenders. Flybridge boats controlled from the bridge will often have a crane on the bow and chocks or a cradle that can stow your tender on the foredeck. Then, it can launch while the boat is med-moored. But if the helm is on the main deck, this isn’t really an option. 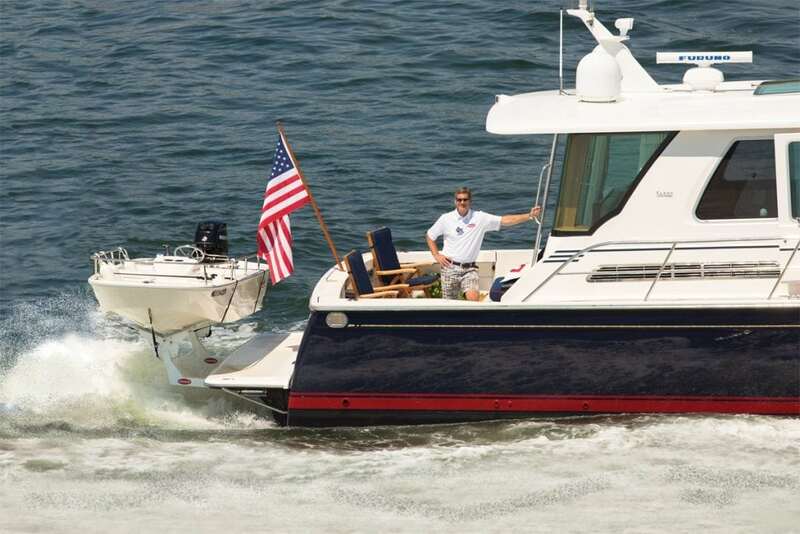 Similar setups on the aft flybridge deck allow some vessels to carry substantial RIBS and hard-bottom boats like Boston Whalers; however, there are limitations to the tender’s weight and size as well as what the deck can handle. Crane launching is limited to relatively calm conditions because the tender could swing out of control and cause damage. Davit systems require balanced lifting harnesses and substantial tie-downs to keep them stable and secure on deck. Once the dinghy is in the water, chocks can get in the way, but some are removable and leave the decks open for entertaining. Don’t Stow Your Tender… Tow Your Tender! Towing a tender is a popular option. 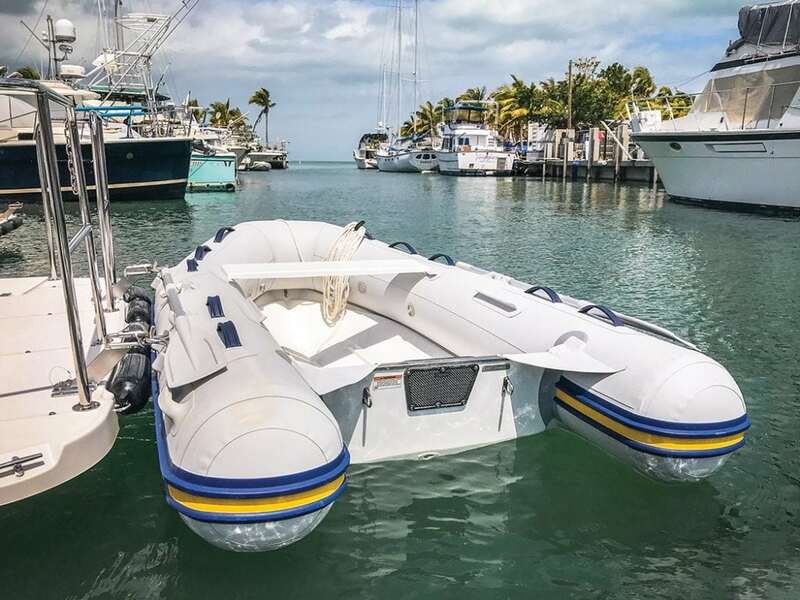 There are some very well-thought-out commercially available tow rigs, and properly sized tow harnesses with large lines or cables allow even moderately sized vessels to pull substantial RIBs, Boston Whalers and small center consoles. The key is to figure out an appropriate setup and rig it properly ahead of time. It’s not as simple as tying a line on the little D-ring that is meant to clip your dinghy to a trailer and taking off at 30 knots for Bimini. You must use special heavy-duty tow eyes and three-point harnesses correctly. Even when properly rigged, towing has limitations. You’ll have to keep watch to ensure the tow vessel is still attached. 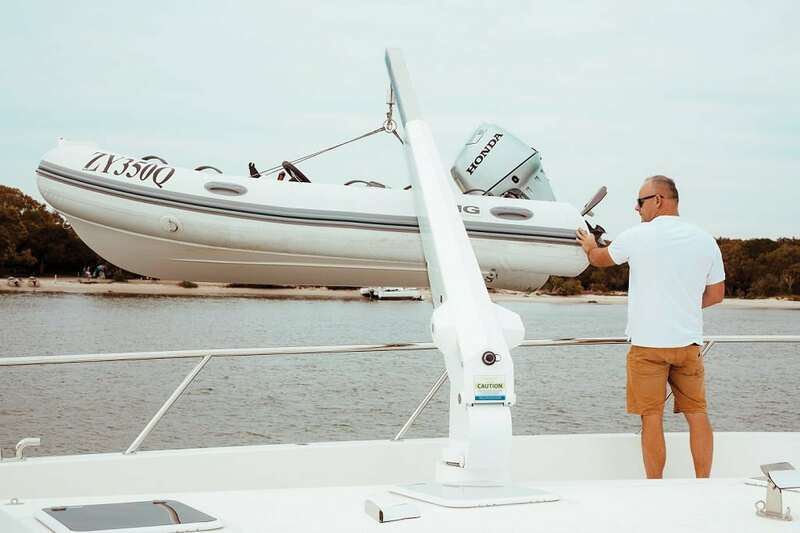 Electronic tow alarms can help, but someone still must keep an eye on the dinghy, since the skipper needs to look forward, especially in shallow Bahamian waters. That towing rig may be perfect in calm waters, but in the Gulf Stream, things can change fast. If the towline parts, the spring-back whips violently toward the boat and can be deadly; losing a tow and trying to retrieve it in rough water is equally dangerous. Towing also affects the performance and fuel consumption of the pulling vessel, and long tow lines can foul props if not careful when docking. In other words, towing is not for everyone. Smaller boats and those not configured for garages, cranes, and deck cradles can still carry substantial tenders. Traditionally, vessels were rigged with hang davits (think the lifeboats on the Titanic). Some still use those systems (mostly sailboats), but those systems can’t handle heavier RIBS and outboards. Modern systems for transom/swim-step tender storage come in all shapes and sizes. Submersible swim platforms are an option on many boats or as a retrofit for existing vessels. You’ll find swim platforms on boats in the 30- to 60-foot range. They’re popular because many companies manufacture, sell and install these systems. A detachable section of the swim platform is lowered and raised to launch and retrieve by actuator-controlled hydraulic arms. The tender enters a cradle when it is submerged and then is lifted clear of the water for tie-down stowage. This makes launch and retrieval easy when you stow your tender on the swim platform. There are limitations to the size of tender and outboard that can be lifted, and putting a lot of weight on your transom affects boat performance, so properly matching the right size dinghy for the boat is important. External systems, such as Freedom Lift, can accomplish the same thing without moving the swim platform and may be an easier retrofit for some boats. Another way to stow your tender is on the swim platform. Less expensive options that work well on smaller boats include snap davits. Stainless steel davit heads with clips will attach to the back edge of the swim platform and on the dinghy. When the dinghy comes up alongside, it clips on. Although the dinghy remains in the water, it stays in place, making it easy for kids, dogs or anyone else to get on or off. Once everyone is out, cant the dinghy vertically and lock in place with standoff brackets for stowage. Snap davits work on small to midsize RIBS and a variety of hard dinghies. The basic system requires removing the outboard before the dinghy is lifted either manually or by a winch. A hydraulic lift system operated by a foot pedal can raise and lower larger tenders. A stainless bracket known as a Weaver Leaver keeps the outboard level while the tender is cranked up and then locks in place for stowage. You can safely launch, retrieve and stow a tender with proper preparation and equipment. And now, you can explore the Bahamian shores to your heart’s content.